The Conditional Print Dialog in BarTender is referenced as the When to Print or Suppression dialog. The When to Print dialog is used for Objects, Layers, Templates, and Backgrounds to conditionally print. 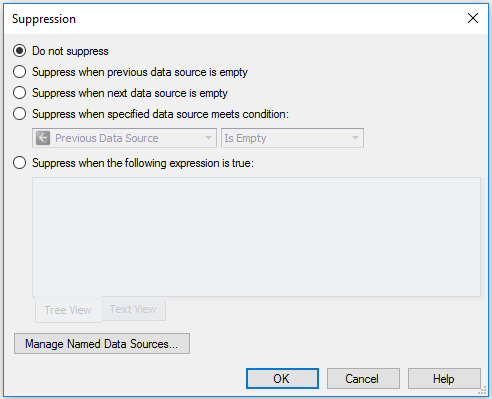 The Suppression dialog appears when transforming Data Sources within an object. 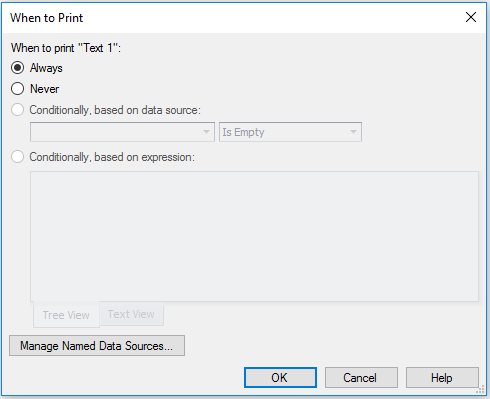 The When to Print Dialog appears when configuring Objects, Layers, Templates, and Backgrounds to conditionally print. When selected, always prints the selected object, layer, template, or background. When selected, never prints the selected object, layer, template, or background. When selected, prints the selected object, layer, template, or background only when the selected data source meets the specified condition. Use in situations where there is only one condition that controls the print status. The Suppression Dialog appears when configuring a Data Source in an object to conditionally print or suppress. When enabled, always prints the selected data source. When enabled, avoids printing the selected data source when the previous data source in the object contains no data. If there are no other data source attached to the object, the object will print as normal. When enabled, avoids printing the selected data source when the next data source in the object contains no data. If there are no other data source attached to the object, the object will print as normal. When enabled, does not print the selected data source when another specified data source meets a condition. Use this option in situations where there will be only one single condition that controls the print status. When Conditionally, based on expression or Suppress when the following expression is true is selected you can specify a complex conditional statement to determine when the component in question prints. When enabled, it allows you to specify a complex conditional statement to determine when a selected object, layer, template, or background will print. This option is ideal for situations that require more than one condition. Conditional expressions can be created in either Tree View or Text View. Even the most complex expressions are composed of simple expressions, which are then combined together with conditional joiners to create a final product. To build a complex expression, you must know how to customize conditions, add conditions, and finally, add groups of conditions. Next to the desired joiner, click to add a new condition. Alternatively, you can click on the joiner and select Add Condition. Click on [Data Source] and select the desired named data source or database field from the list. Click on the Operator and select the desired operator for use. If necessary, click on <enter a value> to type in the desired value. In the Tree View, click on the conditional joiner. Click Add Group. By default, the new conditional group will be created with the AND joiner and a single condition. Click on the new Joiner and select the desired joiner type. If you need more than one condition, click the icon. Alternatively, you can click on the joiner and select Add Condition from the conditional menu to add conditions to the joiner. 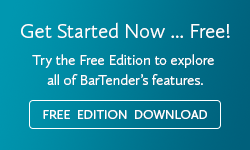 Tip: For additional help consult the BarTender help system by clicking on any of the Help Icons through out the software or clicking Help> BarTender Help.